AS Roma appointed former Lille boss Rudi Garcia as their new coach on Wednesday, the latest in a long line of managers tasked with trying to turn vast potential into elusive silverware. The well-supported club, who play in Rome's huge Stadio Olimpico and have boasted a number of famous players such as Brazil World Cup winner Cafu, have only won the Italian title three times with the last scudetto coming in 2001. "We are very excited and confident that Rudi Garcia is the right coach for AS Roma. He is a proven winner with a great football mind who we believe fits in perfectly with our vision for the future," Roma President James Pallotta said in a statement. He succeeds Aurelio Andreazzoli, who led Roma to a sixth place finish in Serie A this season but was widely seen as a temporary appointment. Former assistant boss Andreazzoli took over in mid-season from Zdenek Zeman but the club lost in the final of the Italian Cup to city rivals Lazio, missing out on a place in the Europa League. 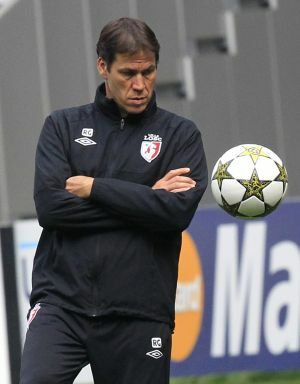 Garcia, 49, who will sign a two-year contract, was at Lille for five seasons and guided the team to the Ligue 1 title and the French Cup in 2011. Last season the club finished in sixth place and Garcia's departure looked on the cards. "The players need to feel comfortable, you must never forget a birthday, sometimes it's the little things that count," Garcia, Roma's first French coach, was quoted as saying on the club's website. "I don't command, I discuss things, tweak things and bring the players along," he said. The usually fast-paced Italian managerial merry-go-round has gone into overdrive since the end of the season, with Rafael Benitez joining Napoli from Chelsea and Walter Mazzarri leaving Napoli to join Inter Milan. Lille issued a statement thanking Garcia. "His name will stay in the club's history forever," it said.